Enjoyment is all about the wide-open spaces. 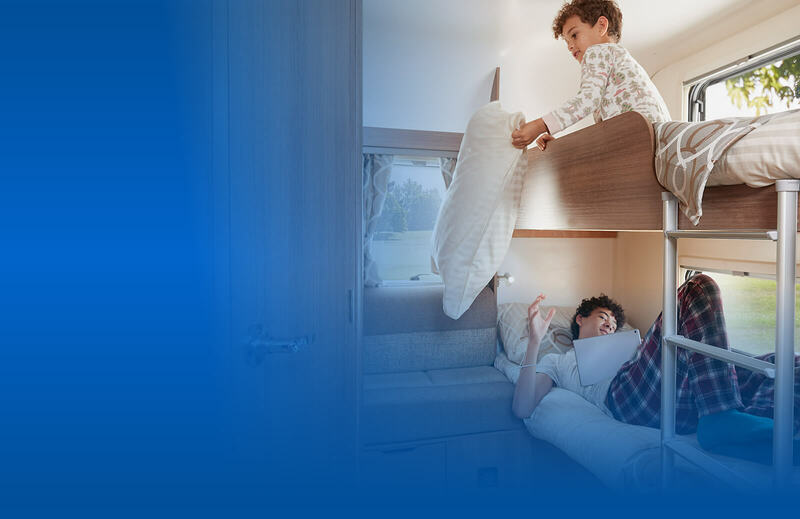 And the new Pegasus Grande gives you more space all round, with a wider body creating a feel of comfort and space that you and the whole family will love. More space. More choice. More enjoyment. With an extra wide body at 8ft, the Pegasus Grande gives you a whole lot more to enjoy. Get out into the back of beyond or use it as your own home from home somewhere special. With plenty of room to relax, you'll be able to stretch those legs wherever you go. Small problem with caravan, dealt with efficiently & effectively at my convenience. The team were really helpful, pleasant to deal with and professional. The caravan was ready and service as promised and the hand over from Nigel was brilliant - well done - My only reservation was the standard of pre-sale cleaning could have been better e.g flies still lying on the vent insect nets, the table storage well not cleaned of insects lying in there. A fantastic all round experience from Lady Bailey caravans. The sale and handover process was really thorough and although we are experienced caravanners we still found it extremely useful. Thank you to all the team for the help in finding a great caravan. Very professional good service. excellent product. Having viewed the Pegasus Grand Messina at the Caravan show rather than committing decided to have a search on the internet which was where I found Lady Bailey. Offered a competitive price on existing van and new van was £1,500 cheaper than any deal I had previously found. Handover was seamless with Les sorting out the paperwork and Nigel providing a very thorough guide of new van. Long way to go from Staffs but eased by the complimentary 2 night stay at Wareham Forrest in case of any issues and to try out the new van. No hesitation in recommending, great deal, great service. We were delighted with our experience in dealing with Lady Bailey, from our initial enquiry through to the handover of our new Bailey Cartagena. The whole sale process was handled remotely via phone/email, and they were professionally set up to manage all the sales documents. The handover was very informative and thorough. And so far we’ve been delighted with our new van. Very good service from buying our new caravan to the delivery and handover. Everything was explained by Les and Alan and the whole procedure was made very easy for us as customers. Well done to all at Lady Bailey Caravans. excellent deal by lady bailey, Les the sales person was very good . A very professional handover of my new unicorn . The sales staff (Les and Nigel) were excellent in explaining the complex aspects of the functionality of the caravans equipment. The caravan had been prepared very well and we have no qualms in recommending Lady Bailey . The caravan at pickup was well prepared and good instruction given at handover.further queries were promptly handled. This is the 5th caravan I have bought from Lady Bailey Caravans,always had good service,the salesman Les very helpful.The caravan was delivered on time,communication and handover was very good. I collected my new Bailey Phoenix Caravan last Wednesday and overnight found a couple of faults that were put right next morning by Lady Bailey service engineer no fuss it was just fixed . Thank you for your prompt attention. Very good service and a thorough hand over and understanding of the caravan operation, thanks Nigel. treated with respect and it was a pleasure doing business with simon and his team. They explained everything in great detail. We are looking forward to finally getting on the road. Excellent service,Les was excellent no pressured for a sale left us alone to look over van,and we asked for some jobs to be done with no problem. Very good service even down to booking us in at the Warren Forest camp site for two nights. Both Les & Nigel were very friendly & professional. The caravan we purchased was in a very good clean condition.. Very happy with the service given by everyone we dealt with when purchasing our new caravan. Can't wait to get away in it. Great handover of our caravan, dealt with both efficiently and courteously by both Les and Nigel. Felt we were dealing with people that care and make efforts to ensure all goes well. Great customer service from Simon on our recent purchase. He was friendly and helpful and on collection we had a detailed handover from Nigel who definitely knows his stuff. Even the lady on the till who's name I don't know was friendly and helpful. Also a free weekend at wareham forest to try it out, nice bonus. This is the third caravan we have purchased from Lady Bailey and the customer service has always been exceptional, we wouldn't go any where else. No teething problems with the caravan either. I was very impressed with the trouble the staff went to to make the purchase of my new caravan as stress-free as possible. Simon handled the business side very professionally and Nigel explained the van's many features clearly and patiently. Excellent buying experience and handover at a very competitive price. I have just purchased a 6 year old series 2 Bailey Unicorn Valencia from Lady Bailey Caravans, the second caravan I've purchased from them in the last 18 years. From the initial conversation with Chris (Director) and subsequently Les, the service was excellent. Everything was fully explained, and I'm delighted with the deal I secured on the caravan. The hand-over by Nigel on the day of collection was exceptionally good; he knows his stuff, and patiently explained how everything worked. I would recommend the company, and would buy from them again. They are honest and trustworthy, and if you're willing to buy Les a beer anything is possible....!! We purchased an Bailey Orion 440-4 from Lady Bailey and have been very impressed with the service given. Both Les and Nigel were extremely helpful and made the purchase and handover a pleasure. The only minor issue was that the caravan had not been cleaned too well in places but this was rectified before we left site on the pick-up day. I would thoroughly recommend Lady Bailey to anyone looking for a new or used caravan. Fantastic professional group of people. Very good stock of used caravans which gave us a lot to choose from. We found one that we are very impressed with for our future holidays. Big thanks to Simon, Les and Nigel for helping us get the van we have. Some things not checked before delivery eg roof blinds, radio and shower shelf. we found all the staff we delt with very helpfull, especially Les who sold us our caravan. nothing was to much trouble and he had a good knolledge of his stock. not atall pushy with the sale but was allways ready to help.would recomend anyone looking for a van to go have a chat with him. Polite and helpful team (Simon). Understood our needs and were not pushy to make a sale. I liked the way my wife was included in all discussions. On pick up, caravan was in excellent condition, serviced and clean. Nigel gave us excellent handover over two hours, showing us how everything worked. We appreciated the two days in the holiday park. Would recommend Lady Bailey Caravans as quality provider of new and used caravans. Thankyou very much for all your help and kindness making the thansfer from our Bailey Orion to the purchasing of our new Phoenix caravan. The selling and buying process with Simon to the very helpful handover with Nigel much appreciated. Thanks also for our 2 night stay in Wareham forest, lovely site and lovely weather. We found all the staff very helpful and patient. Especially with a couple who didn’t have a clue about camping! Right from Chris one of the directors. Simon from sales Dave in the shop and Alan was especially patient going through the hand over with us. Thank you all for your understanding and professional service. Would certainly recommend you. Also a very large display of caravans, which made it harder for us as we didnt know what we wanted!! Got there in the end. Thank you guys. Sales service not too bad. Handover excellent. Short trip away (two nights), two days after taking delivery of the caravan, revealed some faults. Appointment immediately made for faults to be rectified. Due to a cancellation, Lady Bailey have managed to fit in rectification of the faults within a week. Excellent change over on our way to Cornwall for our holidays, thanks to Les, Nigel and Chris, would recommend Lady Bailey. Professional and friendly service. Many thanks Les and Nigel for all your help. We found all the staff at lady bailey very helpful as this is the first time we have had a caravan . Excellent. The customer service we received from the team was simply fantastic. Les, the salesman, provided excellent advice and help, as we were first time buyers. On collection, Nigel was superb, taking time to talk us through everything we needed to get us started. They even paid for us to stay at a nearby camp for two days. Highly recommended. This is are first venue into caravaning. We found the team at Lady Bailey very helpful and informative. Nigel's hand over was extremely informative and just what we needed before we set off for 2 nights at Wareham Forest. We had a slight problem with the electric hook up (our fault for overloading) but after a telephone call with advice from Sean all was resolved. Thank you for your help. A very good all service all round coupled with an excellent financial deal. Many thanks to all concerned. My mother and I were very satisfied with the service received and advice given on the purchase of our new Bailey caravan. We also thoroughly enjoyed our stay at Wareham Forest. Thank you. Very pleased with the service from looking at the caravan to handover. Good smooth transaction starting with Simon from sales through to hand over by Nigel, which I must say was the best that we have ever experienced, who was patient and knowledgeable. The caravan had been valeted very well and we are very pleased with our purchase. Very helpful friendly staff. Had no problem keeping the caravan for a few weeks until we could collect. Was a very straight forward transaction. Thank you. Easy transfer and sale through Les and very thorough handover by Nigel with everything explained in detail. Final bonus was a two night stay at Wareham forest tourist park to get us used to the van and iron out any problems. Many thanks to all involved. Responded well to a late change in caravan model required. All staff cheerful and willing to assist. We have known the Lady Bailey team for 10 years now, and have nothing but praise for them. We have just taken delivery of our fourth Bailey caravan from LBC, a Bailey Unicorn IV Cadiz. Great service with a smile from the team. Thanks for the advice and we are looking forward to our travels. The handover on collection day by Nigel was truly excellent. The lady in the shop is a Star. Can't say I was overly impressed with them and can't say I wasn't, there wasn't anything that gave me the impression they were happy with sale. To me £15,500 is a lot of money but to them it just felt like it was just another sale. To be honest the lady in the shop was more chatty and welcoming than the actual sales men. When we went to collect the chap that shows you through your van and how everything works was very helpful but it's just so much to try and take in. The good thing is they give you 2 nights at a local campsite so you can get used to things. Would use them again if they have a caravan I'm intrested in. I “shop around” and having decided on the caravan we wanted started to look - went through every dealership connected to Bailey and decided on Ladybailey - despite it being 370 miles away, 2400 cheaper, factory fresh and powertouch mover factory fitted not retro fitted - an obvious choice! Dealing with Simon over the telephone, travelling down, meeting and being shown all the gadgets and gizmo’s by Alan, then off to Wareham Forrest 5* site, compliments of Ladybailey, for a couple of nights. On Sunday Simon came out to us to settle the water controls - easy once shown! A service I’ve not experienced before - and believe me I shop for England! I wouldn’t hesitate to recommend Ladybailey and all their staff - First class customer service - try them - you won’t be disappointed. This is the second new caravan we have purchased recently from Lady Bailey as we realised the first one when we ‘lived it’ was not the best layout for us! On both occasions we have had excellent service from Les the salesman and Nigel for his comprehensive hand over. Also not forgetting the superb Dawn who deals with any warranty issues. We live over 100 miles away but would thoroughly recommend Lady Bailey. All good,very well explained on the handover, few small issues once used for a couple of times, and have had good response to queries. Very helpful and knowledgeable when selling their caravans. Would always recommend buying from them. Great service, friendly staff, very knowledgeable, made my wife and I very welcome. This is the second caravan purchased and both the sales and service staff made the process very straightforward. From ordering to collection, they were very professional. We enjoyed a couple of nights at a local caravan park on a fully serviced pitch, paid for by Lady Bailey, it gave us the chance to see how the caravan differed from our old one and find any immediate issues. We did have a problem with the heating not working on the 230v mains but one phone call and their technician came out to us. It failed again next day and new parts were fitted immediately. Just can’t fault the sales or aftersales support. Highly recommended. everything they promised to do they did it, great service they went further than I expected. Absolutely exceeded our expectations. A superior dealer selling a superior product. When initially making our purchase, we were dealt with in a very professional manner. On collecting our new caravan (used caravan) we felt that the hand over was particularly excellent, a lot of time and attention to detail was given, especially considering the arctic conditions on that day. The only negative comment, I can make is that the 3 month warranty on a used caravan (purchase price £12695) is very limited. Very Impressed by the service given from all members of staff. New van had a few minor issues at first , but were sorted out very swiftly so over all pleased with the van and service. Excellent place to buy a caravan - the staff couldn't have been more helpful - thanks to Les, Nigel and the rest of the team. When we picked up the van it was nice and clean. Very friendly, knowledgeable and non pressurised sale. Excellent service would not hesitate to buy my next caravan from them or recommend them. Love the quality and layout of Bailey caravans and we liked the fact that they have a very good stock. Salesman was helpful without being pushy. Very helpful and friendly,able to have a bit of a joke. Lady Bailey had the type of caravan I was looking. It was clean and tidy when I arrived to collect and the pre-departure briefing was thorough. Despite an administration hiccup, the lack of customer service on my first visit and some missing trim on the fridge when I collected it, I felt Lady Bailey provided a good service. Recently purchased our caravan from Lady Bailey, no hard sell, professional friendly service nothing too much trouble. Handover detailed, thorough and comprehensive, as newcomers to caravanning it was just what we needed. Nigel was superb in clearly explaining everything so succinctly he even checked in on us when we were setting up for the first time at the nearby Wareham Forest site, a 2 night stay paid for by Lady Bailey, an added bonus. Highly recommend this team - if you want to buy a caravan this is the place to go to. All ready for pick up when we arrived even though we were 30 mins early. Very good support from all staff on day of picking up our recent caravan, and the friendly assistance from the workshop guys who made the adjustment to our caravan after a 3 day shakedown. Will have no hesitation using Lady Bailey in the future. From initial viewing to collection everything went well. Les dealt with our purchase very well, Chris came to inspect our part exchange at our home and agreed price and then took our old van with him. Collection of our new Pegasus was very good, Nigel did a very thorough handover. Lady Bailey were also excellent in fixing an issue with the caravan, which occurred following our 2nd journey. They actually came out to our home to fix the problem. First time we've used this dealership, but the staff we dealt with were all very good and would definitely use again. Great Handover by Nigel good service and a nice handover love the fact you get to stay at Wareham Forest paid by Lady Bailey. We new roughly what we wanted and you answered all our questions and concerns. Excellent customer service. Having bought a bailey caravan second hand I was amazed at the the after sales service offered by bailey in the way of spares and parts. You can buy pretty much anything to almost build the van from new!! A shop in Bristol to go to which stocks lots of goodies makes it even better. Les,Nigel,Simon and Chris.Very kind understanding people.Fair and easy to do business with.All have a very positive attitude.Have bought two caravans so far from Lady Bailey.Speaks for itself.Jerry in the workshop, equally as approachable. When we collected our caravan, Alan spent an hour and a half with us going through the various procedures and how to use the equipment. As new caravanners, this was invaluable and it would have taken us so much longer to set up at the site without the information he gave us. The caravan was very clean and tidy, so we were able to move straight in. We would recommend Lady Bailey to anyone intending to purchase a caravan. As first time purchasers, Lady Bailey looked after us very well - Les and Nigel were very helpful and we left with our lovely caravan confident in their advice and service. We wouldn't hesitate to recommend Lady Bailey. I FOUND LADY BAILEY VERY HELPFUL AND PATIENT AS THIS WAS OUR FIRST CARAVAN , WE HAD NO IDEA WHAT TO DO. THEY ALSO BOOKED US ON TO A SITE FOR TWO DAYS TO GET USED TO THE VAN. On arrival we were not pressurised into buying, when we wanted help it was readily available, and could not fault the customer service when purchasing our caravan. Extremely helpful throughout process, including a thorough and useful handover. Many thanks in particular to Simon and Alan. Hassle free experience, and always felt as though we were being treated fairly and helpfully. We found our salesman, Les, to be straightforward yet charming. The handover covered all the important features of the van, which was very useful, bearing in mind the big technical advances compared with our previous 11 year model. Always polite and so helpful.... drinks on hand as soon as you walk through the door.. we have dealt with Baileys for many years and purchased several caravans and been delighted with them. Well done Baileys. Very helpful, pleasant to deal with, and happy to swap my motor mover from the old caravan to the new one, without charge. Simon was on top form the day we picked up our new van after trading in previous van. Having travelled up from Cornwall early morning and arriving at Lady Baileys at 9am, van handover was quick and thorough and we were on our way back home to Cornwall well satisfied. Great service! Well pleased with our caravan would recommend you to friends special thanks to the guy who handed the caravan over sorry can't recall his name! He explained everything in a friendly and informative way! Well done! Decided that we were considering buying our first caravan so decided to visit lady Bailey caravans to have a look. Not knowing a lot about what we were looking at and not 100% made our mind up completely staff were very helpful and not pushy in the slightest. Which helped make the final decision to buy the caravan. Went to wareham forest for the weekend and extremely happy with everything. Thanks for the great all round service. Excellent service. Would happily recommended them. professional, helpful service. Prepared to negotiate date/time of completion of purchase. Nothing was too much trouble for the team at Lady Bailey, from our first enquiry to collecting our new caravan. Chris was extremely informative and helpful with our questions, but at no point did we feel in any way presurred to comit to making a purchase. Once we decided on our purchase,the hand over was exceptional and we have complete faith that if we do have any minor snagging issues, these will be dealt with promptly and efficiently. The level of service we received surpasses any that we have had in the past when buying a caravan, and we would recommend Lady Bailey as the first port of call, regardless of travelling distance involved. Thank you all at Lady Bailey - our new Cabrera is just perfect. Good price on new Bailey Unicorn Vigo. Excellent Service and was accommodated at Wareham Forrest Touring Park with Motor Mover fitted from old Van onto our new one free of charge. No issues with New Van. Thanks for a Great Experience. Very friendly service and efficient . A great service from start to finish, the handover was excellent, a big thank you to all the staff. We travelled down from Central Scotland with some trepidation to have Lady Bailey look at our older caravan for trade in. We were delighted with the friendliness and professionalism we encountered. All (including price offered by 'phone) went exactly to plan and within a few hours of arriving we were back on the road with our new Bailey Brindisi van. The team at Lady Bailey were SO helpful. One of the technicians even travelled down to Wareham Park (did I mention the two free nights given with the new van?) the following day to plug in our fridge (!) Can't speak highly enough of Lady Bailey; we will use them again in the future. The Barnes family. Lovely caravan,helpful staff when we collected it. Had a problem with bed but a member of staff came to our site and rectified the problem. Very impressed. From ordering my new Pegasus caravan to the handover all went smoothly without any hitches The caravan arrived much sooner than expected. Will take the caravan out to Wareham Forest for the first time next week, that should be the real test. Very easy to deal with. No pressure. Very good handover .Friendly and professional team. No problem in picking up old caravan and dropping of new one to our site. All staff were very friendly and helpful. T he part exchange and buying process for our replacement caravan was professional, efficient and friendly. Our "new" caravan was beautifully prepared and presented. Despite a detailed description/instruction on the modern electronics in the "new" caravan a second visit for more training was necessary and solved our minor problems. We would highly recommend Lady Bailey Caravans. Our salesman Les is a real joker and amused us while someone else fitted the number plate to the van. The handover was excellent, although I have 30 years experience with caravans he went through every detail thoroughly, and we did learn a thing or two. It is appreciated they kept the van in storage for three months as we did not require it until April. The van purchased was a Bailey Pursuit 400-2 and is a second van purchased for touring. We already have a larger van that is on a seasonal pitch. A big thank you to ALL the staff, especially SIMON (SALES), NIGEL(FANTASTIC HANDOVER) also JES and ALAN (WORKSHOP) and THE SHOP STAFF. And - not forgetting CHRIS! Our Part Exchange - Motor Caravan to Caravan - was handled like clockwork, in a friendly and helpful way. We spent two nights at the Wareham Forest Touring Park compliments of LBC . Every feature of our new BAILEY MADRID worked perfectly. VERY PLEASED. HIGHLY RECOMMENDED in all respects! Very friendly and helpful to returning customer, gave us a very good deal, made exchange very easy, and the handover straightforward and informative. We have found over the years that we can rely on the staff at Lady Bailey. Ordered a New Caravan which came within a week. Delivered to the site for free. Cannot fault either Simon on the sale, or Nigel on the handover. Would recommend Lady Bailey Caravans to anyone. Lady bailey caravans made every step of the way very easy and non stressful. From the minute I made contact all of the staff were very helpful and responded very quickly to any questions we had. Simon was very professional. The caravan was ready to be collected and Alan did a superb job explaining everything we needed to know at the hand over. I would fully recommend the team to anyone. A huge thank you from us. Very thorougher. Excellent attention to detail. Very polite, kind and patient. No pressure sales. Made us feel valued. Extremely professional. This is our forth caravan purchase and the best service we have ever received. We will Definitely recommend Lady Bailey Caravans to everyone we meet. Very pleased so far the Bailey team were very helpful and are first outing was extremely pleasurable. Thank you Bailey. No fuss, friendly and efficient service - made the whole thing a comfortable and happy experience. All the staff are helpful, supportive and friendly, nothing is too much trouble. The staff also give good knowledgeable advice as to the best Caravan or Motor home to buy. New to caravaning Lez was very help. Great service and loads of helpful advice. Nigel was great on shows my how everything worked when I collected. I live in Derby and the local Bailey dealer was not to co-operative regarding the purchase of a new Bailey Unicorn so I thought I would speak to Lady Bailey on the recommendation of a friend in Liverpool who had purchased a caravan from them a couple of years ago. What a difference in attitude, a pleasure to buy a caravan from Lady Bailey. They gave us a very good deal when exchanging our caravan. All the staff were very helpful and good to deal with. We are very pleased with our new Bailey Vigo and look forward to many happy holidays in it. Great deal and superb detailed and friendly handover experience. A big thank you to Lady Bailey for their excellent service, this is our second 'van from them and the staff couldn't be more helpful. Les was great when helping us chose our new van (although the jokes haven't improved)! Thanks also to Nigel for his stress free handover on our own site. Both my husband and I were very pleased with the service we received at Lady Bailey Caravans at Winterborne Whitechurch. Les, in sales, was extremely helpful with our part exchange and told us the estimated time our new Unicorn Caditz would be delivered. Our new caravan was in fact ready before the estimated date and the handover was extremely helpful with everything being explained in full detail. We cannot recommend the staff at Lady Baileys enough and we are very pleased with our new Unicorn Caditz. Very satisfied with the caravan we've purchased and the items we asked to be addressed we're done with no quibbling at all .Thankyou. They made the transaction easy and pleasureable. Great staff and quality caravn, very pleased. Picked up our new caravan on 12/12/16, travelled 260 miles for a very good deal. The hand over was quick, easy and informative. Lady Bailey thoughtfully put us up for two nights at the lovely Wareham Forest site, where we were able to enjoy our new van and check that all was well with it. We would like to take this oportunity to extend our thanks to all at Lady Bailey. All of the staff at lady baileys are very helpful and knowledgeable without being pushy, les and his duck are the best. We are extremely happy with our caravan and would recommend lady baileys to anyone wanting a caravan. This is the third caravan we bought from you and as before the sevice from all staff members has been exemplary. Honest answers to my questions and were very helpful. The usual great deal and support from the whole LB team, especially Les Cutler. Requests from us were met in full. Excellent hand-over from Nigel, completed our purchase satisfaction. The way the transaction was conducted was good. However the valeting of the caravan fell short of expectations. The draining board and oversink chopping board were missing. Also a carpet from round the toilet which was heavily stained with urine was left with the van. The new van made us happy, it was what we were looking for. Excellent deal, knowledgeable team and an enjoyable experience. Outstanding customer service,and the handover was excellent . A thorough demonstration of all aspects of the caravan. Polite, relaxed and non - pushy nature of the team made us feel welcome and excited about our new caravan. I part exchanged against a new bailey unicorn after traveling 150miles, from the moment I arrvived I was treated really well. The whole experience was a pleasure and the time spent showing us our new was excellent. Two nights stay included at Wareham forest is a great way of settling in and checking your new van. Totally recommend using Lady Bailey. Can't comment on after sales but hopefully if I need it they will be just as good. I bought a second hand Swift Challenger last month. The caravan did have a lot of issues regarding cleaning and maintenance. Between myself and LBC they have been sorted out and compensated for. I feel that after reading other reviews, I have been a bit unlucky with my purchase. On notification of the problems LBC did go out of their way to rectify the issues and assuming that I don't have any more problems, then I would not have any problems of dealing with LBC again. Gave us plenty of time to look around with no pressure to buy, but were there to assist when asked. Were able to give knowledgeable answers to all questions. On collection day I was given a unhurried handover and was showed how everything worked. The two night stay at Wareham Forest gave us plenty of time to get to know our new caravan. I wanted to purchase an Awning for the van but wasn't sure what size etc to buy, was given options on the best Awning to suit the van and was happy with the advice given.